Special family holidays like Thanksgiving & Christmas require two non-negotiable dishes to be provided from the Taylor Household: It’s requested that I bring my desserty dish that I make with cherry pie filling, whipped topping, crushed pineapple, and my own quick homemade Sweetened Condensed Milk. Sometimes I add chopped pecans if there are no allergies to work around – we’ve named the dessert ‘Cherry Shtuff’. Also on the must-have menu is RancherMan’s Famous Green Bean Casserole. Now I’m not exaggerating here, those dishes are NON NEGOTIABLE – we can bring other dishes to the gatherings if we like as long as these two specialties are included! I’ve already shared my Cherry Shtuff recipe with you dear readers, but I’ve recently had several requests to share RancherMan’s most-requested dish. Today’s the day! Anyway – Voila! RancherMan’s Green Bean Casserole! It’s not made complicated by various fru-fru ingredient additions. And it’s absolutely delicious in its simplicity. When we gather for the holidays, everyone brings a dish so we always have lots of food. Sometimes if we’re lucky we can bring back a small serving of my cherry shtuff dessert or a smidge of another dish we brought. But there are never (read NEVER) any leftovers of RancherMan’s green bean casserole. Yeah, it’s that good. Drain one can of green beans and add to casserole dish. Add remaining can of green beans without draining. Stir in 1 can cream of mushroom soup and about 1/2 of the container of french fried onions. Stir gently to incorporate. Want More Holiday Cooking Recipes? This entry was posted in Blog Posts and tagged Christmas, Cooking, Holidays, Recipes, Winter on November 20, 2015 by Texas Homesteader. I can’t make a green bean casserole to save my life! Thanks for sharing on the Whats for Dinner link up! I love the avocado dish, reminds me of when I was younger 🙂 I tried this cream of mushroom green bean casserole and a fresh made one for Thanksgiving and the cream of mushroom won. Sometimes it’s hard to beat old classics. Don’t think it would seem like Thanksgiving and not have the green bean casserole dish; no matter what color you casserole dish is. (mine isn’t green but I have the old brown color.) I’m not much for the French Fried Onions so I deep fry some shallots / onions and also use cut up fried crisp bacon for the topping. I also use fresh green beans,not canned;(fresh beans boiled in water for 2-3 minutes and then dumped in a bowl of ice water to stop the cooking process) and make my own ‘gravy’ in place of the Cream of mushroom soup. Little extra work but like so much better. LOL Greg!! Ya know, you just might be right about that green casserole dish!! All I know is that the casserole is delicious, super-simple to make and much requested and devoured by our family. Win/win/win! Hope you & your family have an awesome Thanksgiving! 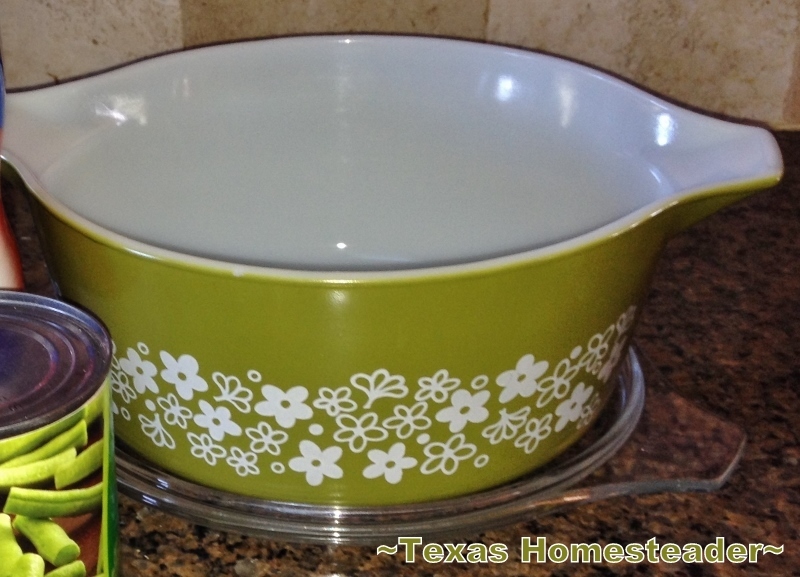 I love the retro green casserole dish-it’s nice to see those lasting things in this throw away world. I think it’s comforting to see your dish on the Thanksgiving table year after year – especially because it’s Rancher Man’s contribution on that special occasion 🙂 . Yes ma’am Sharon. The green bean casserole (and the green casserole dish) has been a tradition for decades, and I’m sure it will be for decades to come. But like you said, what a comfort! Have a great Thanksgiving.